The Ninth Küstendorf International Film and Music Festival will be held from January 22-27, 2016 in Drvengrad on Mokra Gora. The festival is organized by Rasta International under the patronage of the Ministry of Culture and Information of the Republic of Serbia, Gazprom, the city of Mećavnik, and TNSO. As in previous years, Küstendorf is dedicated to future film creators and the world’s film greats. COMPETITION PROGRAMME – As part of the main programme of the festival, 17 films by young directors from Bulgaria, China, Croatia, Hungary, Iceland, Iran, Mexico, Palestine, Russia, Serbia and Spain will compete for the Gold, Silver, and Bronze Eggs. The films in this year’s selection characterize everlasting themes and the diversity of movies and artistic approaches. This year, the international jury consists of the Ethiopian film producer and documentary film director, Maji-da Abdi, and Divna Vuksanović, Serbian philosopher, writer and media theorist, and Flaminio Zadra, film producer from Rome. The Vilko Filač award for Best Cinematography will be presented by the French cinematographer, Diane Baratier, and Swedish cinematographer of Hungarian descent István Borbás. As in previous years, the selector of the Competition Programe is Dunja Kusturica. CONTEMPORARY TRENDS – This programme highlights some of the best films of the previous year. These films will be presented by their authors – the guests of the festival – who will lead workshops after the screening. Over the course of the six festival days, the following movies will be shown: Dheepan, last year’s winner of the Palme d’Or at the Cannes Film Festival directed by Jacques Audiard; The Treasure by Corneliu Porumboiu that received the A Certain Talent Prize at the Cannes Film Festival as a part of their Un Certain Regard programme; Matteo Garrone’s Tale of Tales, which was screened as a part of the main competition programme at the Cannes Film Festival. In addition, the Küstendorf 2009 winner Kohki Hаsei will present his debut feature film Blanka, which received two awards at last year’s Venice Film Festival. The programme will also show Paolo Sorrentino’s Youth, awarded Best European Film by the European Film Academy, and The Clan by Pablo Trapero who won the Silver Lion for Best Director in Venice. DECOLONIZATION OF FILM – A new programme on the Küstendorf festival brings us films which question the dominant narratives about the relationship between the exploiter and the exploited in a neocolonial context, including those about class relations within contemporary societies. The following documentaries will be screened as a part of this programme: Concerning Violence by Goran Hugo Olsson, Captain Thomas Sankara by Christophe Cupelin, and A German Youth by Jean-Gabriel Periot, and the feature film by Jia Zhangke Mountains May Depart, which tackles the issues this programme is dedicated to from the author’s perspective. RETROSPECTIVE OF GREATNESS – As part of this programme Jacques Audiard’s films will be screened, and a special segment of the programme will be dedicated to the work of producer Karl Baumgartner. Emir Kusturica will speak about his work with this German producer and will hold a lecture about the Czechoslovakian director František Vláčil. 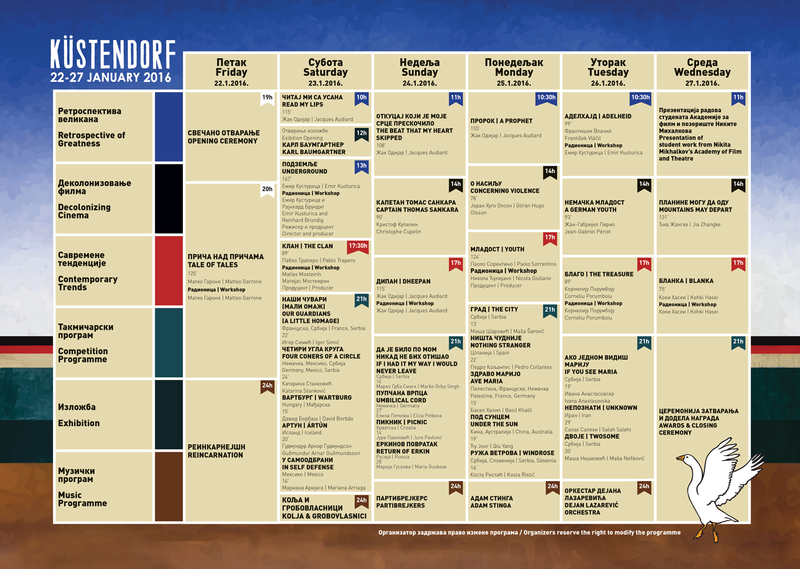 MUSIC PROGRAMME – Each night, after the screening and the workshops, concerts by musical groups will complete the famous atmosphere of the Kustendorf nightlife. This programme will include the Serbian rock groups Partybreakers and Kolja & Grobovlasnici, Armenian reggae and ska attraction Reincarnation, and the Moldovan trumpet player Adam Stinga. The 2016 Küstendorf International Film and Music Festival will host famed directors, actors, and musicians, as well as numerous young film directors and students of film schools from around the world and other eminent guests from the world of film.